Medium Hairstyles for Round Faces. 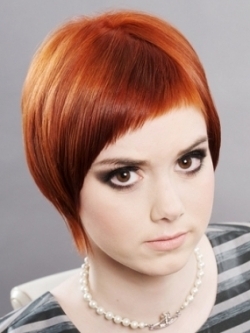 Medium hairstyles are the ultimate expression of femininity and seductiveness, being highly versatile. Finding a suitable hairstyle for a round face shape is easy as long as you keep in mind a few basic principles to help you make the right selection. Discover the most suitable medium hairstyles for your face shape. Round faces can be easily recognized due to the fact that the length of the face is almost identical to the width. Medium hairstyles can look adorable on those who have a round face as long as the right choice is made. Being fairly easy to maintain and offering a multitude of options when it comes to styling, medium hairstyles are preferred by the majority of women. When selecting a hairstyle for a round face it's important to understand what are the main goals that a hairstyle should meet in order to be considered suitable and what are the styles that should be avoided due to the fact that they don't help to emphasize the best facial features of a person with a round face. Generally speaking, an appropriate hairstyle is one that elongates the face and reduces the width. The hairstyles which minimize the hair volume around the face are considered suitable unlike the hairstyles that mirror this face shape. While the final decision will be influenced by other factors as well such as hair texture, age or lifestyle, it's best to keep in mind the following recommendations in order to make the selection easier. Medium layered hairstyles work great for round faces. Soft graduated layers have a great slimming effect on the face and wispy ends can really bring out the best features of a round face. If you choose a layered hairstyle, make sure that the layers don't end exactly at the chin line as this is another factor that emphasizes roundness. Although layered hairstyles generally complement round faces well, there is one exception from this rule. The exception refers to curly hairstyles which might not be the most suitable choice in the majority of cases. Layered curly hairstyles will only emphasize the roundness of the face even more by adding weight on the cheekbone area. If you have naturally curly hair, try keeping your hair at the same length overall to make sure that you don't add unnecessary volume to the face. Wavy hairstyles on the other hand are a much better choice. Make sure you avoid blunt cuts as these might prove to be too contrasting compared to your facial features and as a result they might be unflattering. Sleek straight hairstyles are another optimal choice for those who have this face shape for the same reason listed above. 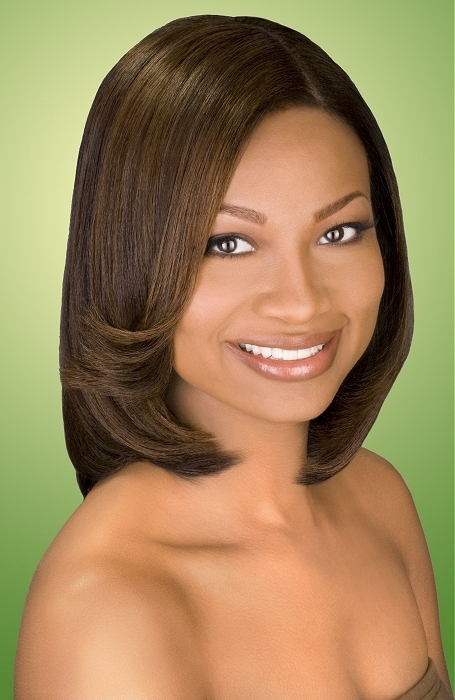 Straight hairstyles frame the face nicely drawing attention to the eyes instead of the cheekbones. Take advantage of the modern styling techniques to create amazing hairstyles that will emphasize your hair texture. As far as the suitable bangs styles are concerned, your best bet would be to opt for stylish side swept bangs to perk up your style while slimming your face at the same time. 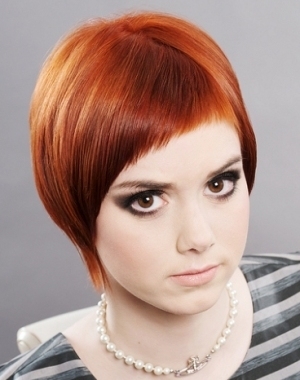 Full bangs on the other hand should generally be avoided due to the fact that they tend to add more width to the face. If you like bob hairstyles, you will be pleased to find out that a mid-length bob hairstyle might be just what you need if you have a round face. 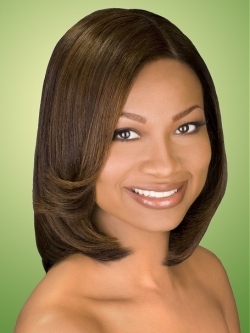 A layered bob would be extremely flattering under the condition to avoid flipping out the ends of the hair. Classic bobs work equally well, but if you are really adventurous when it comes to hair styling, you can also create a groovy bob hairstyle if you use the right styling tools. A great advantage of bob hairstyles is that there are a variety of choices for every age, being classy or modern depending on the cutting technique or depending on the styling options a person chooses.